In this comparison seeing the metro as a metonym for a metro system as a whole may also match the intended interpretation, but only if perceived from the right perspective. While the metaphor states that A METRO IS AN ANT IN AN ANT FARM, it can also be said that, to a certain extent, A METRO SYSTEM IS AN ANT FARM, but this primarily to the metro as an ant. With this metaphor, the fact that the government, whether English, Dutch or French, controls public transport and looks over (or at least, has to look over) the functionality of the metros (and the metro system as a whole) is emphasized. Once the metro, and the system in which it functions, stops being of use, ceases to be of purpose, it can be let go of: be neglected or destroyed. The government may cease to repair and/or update the metros and the system and subsequently it will enter a state of disrepair. Likewise, if someone loses interest in the ants, the ant farm may be gotten rid of or become a mess. Examples of how the government deals with/takes care of its metro system can be found in the news. For this metaphor, the plans of the French government to introduce a ‘supermetro’, the ‘Grand Paris Express’, served as inspiration. This metaphor could be characterized as an MP1. In several ways the context serves to clarify that the metro is to represent an ant, though the ant is not depicted. First of all, the main texture is to signify sand, containing small tunnels dug by something, such as an ant or a mole. Secondly, even though the metros may seem to be hopping around, they were meant to indicate how ants, or possibly moles, are to move around through these tunnels Thirdly, the wooden panel to the right is to suggest that what we’re dealing with is not just a dissection of the earth: what is depicted is actually a toy, an ant farm, and thus the metro is to depict an ant and not a mole. The presence of merely elements of nature and no industry atop of the sand can be considered a fourth guiding characteristic: the texture is to represent solely sand, taken from nature and so the depicted digging element, the metro, is to be a token of this. The metonymical purpose of the source and possibly the target, the metro and the ant, the former in relation to the metro system and the latter to the ant farm, should become evident once the viewer understands the function of the wooden panel depicted on the right side of the drawing. If it is recognized by the interpreter that what is depicted is an element in an ant farm, it will become clear that the metro is an ant and not a mole. It is therefore not possible to say that the second term is “unambiguously suggested by the pictorial context”, even though this has surely been my intention. What can be said, however, is that when the pictorial context is removed the second term will become impossible to identify and thus a ‘non-metaphor’ will be the result (Forceville 2006, p. 163). Since the pictorial context is all we have, this MP1 metaphor is mono-modal: the source and target are predominantly pictorially or visually rendered. Although there is some text, namely ‘LOUVRE RIVOLI’, which may give a hint for the intended interpretation, this is metonymically related to a term already represented pictorially. The text does not cue the other term, the source, and thus this representation remains mono-modal. In this case only the target, the metro is depicted pictorially in a representation that combines the modes of drawing, painting and a bit of collage (after all, the metros have been copied and pasted on the painted drawing). 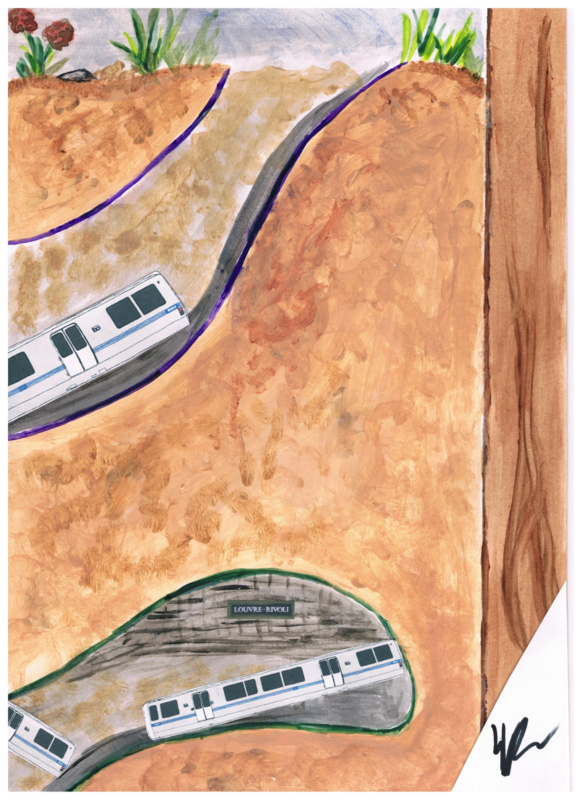 This metaphor is artistic and this is one reason why I have chosen to convey my metaphor via this mode and medium/material: viewers should have the chance to (leisurely) interpret my work as a perspective on how metros function. If I had used different modes and mediums: 1) the metaphor might have been easier to interpret 2) the metaphor would have been different in its representation in order to match the medium 3) different covert features may have (unintentionally) be emphasized or come to light. For instance, this metaphor could have been conveyed multi-modally, by using both the pictorial and aural mode. In theory, if the target remains to be pictorial, as the metro, but sound is included for denoting the source, it might be easier to derive the correct interpretation. After all, by having the audio information, the viewer might be able to better distinguish whether or not the metro is to depict an ant and not a mole. Then, if the metaphor was presented via the TV as its medium, while employing both the visual and the aural modes, again it would be easier to get the right interpretation, since in depicting the metaphor filmically, the metro could, f.i., grow legs and his behavior and movements can be perceived. At the same time the medium-specific characteristics would contribute to changes in the representation. If presented in the realm of TV, the metaphor would likely be presented to a general audience with a limited attention span within a (usually rather limited) time slot. As a result, the metaphor might have to be made more interesting, by including more modes, and more cues would be provided in order to make it easier to interpret. The metaphor would have to be made obvious, so that ideally any member of the general public would be able to grasp the message. Perhaps adding more symbols to the representation, such as the ‘M’ for metro, and including verbal information for anchoring the source, would ensure this. Here I would have to make sure that the intended features are emphasized and not, for example, the metro and ant’s speed and mobility. Another way in which this metaphor could be conveyed, mono-modally, is via the medium of the (complete) collage. If this had been the case, perhaps the metaphor would have been easier to interpret. After all, my drawing/painting style requires more effort to interpret than a picture which is meant to present a copy of reality, what we observe and perceive, relatively unmediated by style. In addition, had it been conveyed via one of the mediums of sculpture (such as clay, aluminum) the medium of sculpture, in the tactile mode, also mono-modally, all three differences might have applied. In a sculptural representation the fact that the metro is to be regarded as an ant in an ant farm could perhaps have been more clear, by either making a complete representation of an ant farm with metros in it, while using the right texture/materials, such as iron and sand, or creating a hybrid metaphor by using either material and conveying the metaphor mono-modally (which entails a new representation). This different, hybrid representation would perhaps have led to the emphasizing, and suggesting the mapping of, different covert features, such as a shared rectangular body-shape. My friends did match part of the intended metaphor and this to different degrees. One thought the metro was a train. All the responses included some doubt, concerning whether the metro was an ant or a mole [that is what I would have guessed]. The aspect of the ant farm required explanation. It could be argued that this might be due to a lack of knowledge about what an ant farm is. However, one of my friends did know about the ant farm and just did not catch it, which might have been due to a bad execution on my part or a lack of concentration on his. In the end, none of them saw the metro as a metonym of the metro system, but this did not present an issue, as this was only included as an acceptable extension of the interpretation I intended. Unfortunately this was an issue that I had foreseen but did not seem avoidable. Depicting the metro in an ant farm metonymically seemed to be the best solution for uniquely yet strongly visualizing the metaphorical connection made between the metro system and the ant farm. Unfortunately, the ant farm element of the metaphor has not been visualized adequately. Of course, the fact that the necessary socio-cultural knowledge is missing, for a large part, does not help either. Another interpretation issue arose with regards to the relation between the metro and its passengers. Since it is common to interpret a crowd of people as a cluster of ants or as describing one’s experience in a crowd as that of being in an ‘anthill’ (at least, in Dutch), once having gained the primary understanding that the second intended term was to be ‘ant’, some had trouble distinguishing between attributing features to the metro and attributing features to the passengers who are taking the metro. This can be regarded as a metonymical issue. One should regard the ‘metro system’ in the sense of all the metros functioning together, the context in which they function. As ants function or live within the confines of an ant farm, so do metros function and ‘live’ within the metro system. If one perceives the metro as such, metonymically, from this perspective, then this extended interpretation is still in line with the interpretation I intended. See, f.i., this article: http://www.liberation.fr/economie/2013/03/06/grand-paris-le-supermetro-enfin-sur-les-rails_886666. This article discusses the French PM Ayrault’s presentation of the plans for a ‘supermetro’, one to be finalized in 2030. More information can also be found here: http://fr.wikipedia.org/wiki/Grand_Paris_Express. Louvre-Rivoli is (the name of) a subway station of the Parisian metro. In the sense that no commercial interests apply. Admittedly, this would still not have been an easy task. Ants, nor moles, make very distinguishable sounds. The audio-material that could have been included would therefore probably have been of the animal scurrying around instead. Thus, ‘digging’ sounds would have been used. A ‘complete collage’ meaning a collage that consists of the combination of cut out elements on its own. This in contrast to my drawing-painting-project in which some metros were glued onto the paper. Of course you do have to take some stylistic elements into account, such as the staging of elements, arrangement and the perspective taken. It is possible, and it perhaps even needs to be admitted, that I did not provide enough salient cues for the metaphor depicted. The panel to the right might not be ‘odd’ enough to be noticed, either. Perhaps having presented this panel as green and made of plastic would have made it stand out more. See the appendix for getting an idea of what inspired me to convey my metaphor like this. Admittedly, using a bigger paper or canvas and thus drawing an ant farm out completely might have helped, but this was not doable because of a lack of materials, time and other constraints. Perhaps focusing on depicting the ant farm itself, the source, and using the symbol ‘M’ for the metro, would have presented a solution.